Tracking PayPal conversions reliably can be challenging. PayPal takes customers away from your site to enter their payment information and they don't always return. 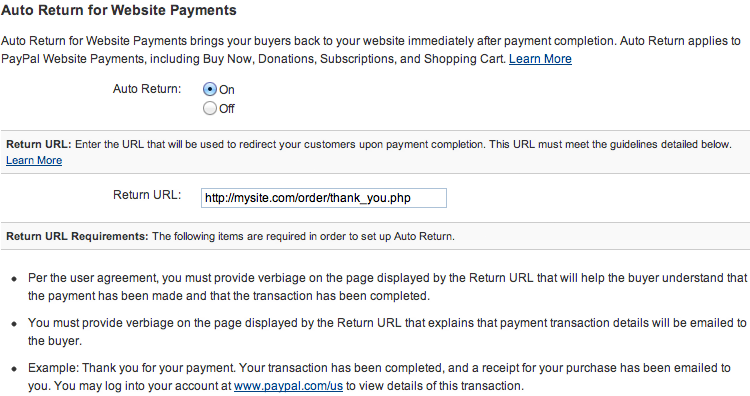 To ensure that they do, we need to verify that PayPal auto return is set up correctly. Click Profile in the top navigation. Click My Selling Tools in the navigation on the left. Click Update on the "Website preferences" line under "Selling Online." Under "Auto Return for Website Payments" turn "Auto Return" On. For the Return URL, enter the absolute URL to your "Thank You" page. You may need to complete a test checkout on your cart to find this URL, or consult with your shopping cart's documentation.